The Central Bank has significantly raised its forecast for economic growth this year and now expects GDP to grow by 4.5%, up from its previous estimate of 3.5%. In an upbeat assessment, the bank has increased its forecast for jobs growth, which it says is now running at a record pace, and predicts that economic expansion will remain strong next year with GDP growth of 3.5%. The bank is expecting a 3% rise this year in the numbers at work – an increase of more than 60,000 people – bringing total employment up to 2.1 million, the highest level since 2008. The unemployment rate is projected to fall to an average of 6.2% this year and 5.6% in 2018. In its latest quarterly bulletin, the bank repeats its warning that Brexit and other international factors continue to pose risks to the outlook. However with uncertainty about how Brexit will happen, the bank says it has not made any further adjustments to its forecasts. However, it cautions that “Brexit and the sensitivity to broader international shocks are highlighted as concerns”. 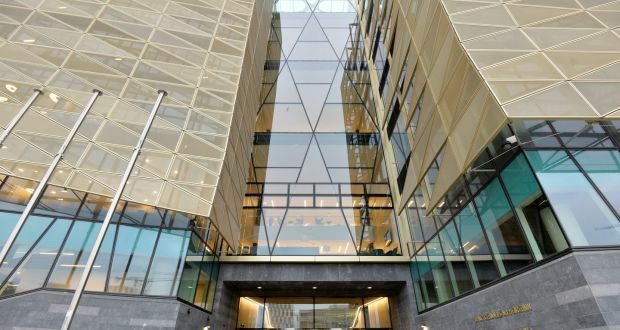 The bank’s chief economist Gabriel Fagan, speaking at a briefing on the bulletin, pointed out that Brexit will not actually occur until 2019, beyond the bank’s current time horizon for its economic forecasts. For the moment, the main impact was via sterling weakness, he said, though it was possible that confidence could be hit next year in the run up to Britain’s EU exit, potentially hitting investment. Growth in employment and incomes – and a resulting rise in consumer spending – are expected to remain the main drivers of growth, the bank says. Higher jobs growth is one reason why it has increased its growth forecast. The bank says that its measure of the underlying growth of the domestic economy will increase by around 4.5% this year. Stronger than expected growth in the euro zone means its forecasts for export growth have also been pushed higher. The volume of exports is now expected to rise by 5.2% this year. The bank has cut its forecast for the rate of inflation this year to just 0.3%, down from 0.7% previously.This is because a stronger than expected rate for the euro against other currencies, particularly sterling, has pushed down import prices. In a generally positive assessment, Mr Fagan said the “Irish economy continues to grow at a strong pace and the prospects for sustained and solid economic growth remain positive”. He said the revised projections for growth “reflect both stronger momentum in the domestic economy and improved prospects for external demand, especially from our European trading partners”. However, he warned that the impact of Brexit was likely to be “negative and material”. Mr Fagan added that the Government must “continue to prudently monitor the risk of overheating”. He said that the bank saw “no real, strong evidence” of overheating in the economy at the moment but caution was needed as it was difficult to assess how tight things were in certain areas of the economy. The bank also points out that the revised measure of the economy recently produced by the CSO, called Gross National Income (GNI), leads to a higher level for Ireland’s deficit and debt as a percentage of national income. Against this backdrop, Mr Fagan said that Government policy needed to focus on underpinning stability and reducing uncertainty.